The 2018 William and Mary squad is no stranger to last-minute comebacks. Oct. 2, senior midfielder Mackenzie Kober scored a game-winning goal with barely more than five minutes left. Sept. 6, sophomore midfielder Meredith Beam knocked the deciding goal off of the left goalpost with 1:13 left in regulation. Finally, Sept. 2, sophomore defender Alex Kuhnle hit twine to seal a victory with just 0:13 on the clock. Oct. 21 against Northeastern, it felt like that familiar last-minute goal was just one lucky break away, as the Tribe fought to even a 1-0 deficit and secure a spot in the Colonial Athletic Association postseason. But the game-saving tally never came, and now that tense Sunday afternoon will coalesce into a stagnant weekend of waiting to see if this season will continue. 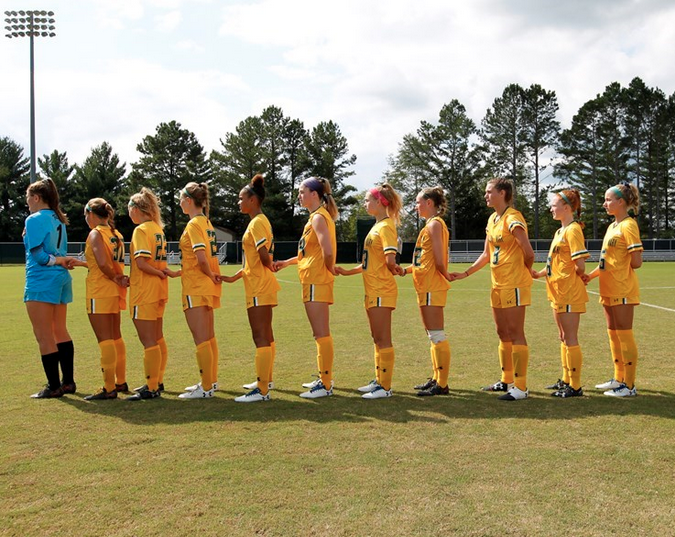 In its final regular-season match of 2018, the College (6-10-1, 3-5-1 CAA) was blanked by the Huskies (10-8-1, 7-2-0 CAA), 1-0. With the loss, the College faces the risk of its first playoffs absence in seven seasons. Northeastern, the 2016 CAA champions and 2017 runner-ups, started out this season on a tear, going 6-0 to open conference play. But by the time the College faced the team Sunday, it had fallen to 6-2 after a two-game losing skid. The visitors were forced to fight the Tribe for every inch of turf they gained in the afternoon match. The first scoring chance Sunday belonged to the Tribe, three minutes into the first half. Kuhnle cut into the box and passed to redshirt junior forward Sarah Segan, who didn’t get enough power on the shot to spin the ball past the hands of Huskies goalkeeper Nathalie Nidetch. That wouldn’t be the first of Segan’s opportunities in the game. She ended up leading the team with three shots, including two on goal, as the Tribe and the Huskies traded chances back and forth. For Northeastern, forward Chelsea Domond led the squad in scoring opportunities. She answered the Tribe’s early chances by forcing relentless offensive surges. 16 minutes into the half, she managed to put the ball on net even as she fell to the ground for the Huskies’ first shot of the game. 10 minutes later, she threaded again through the Tribe defense, but couldn’t get the ball past junior goalkeeper Katelyn Briguglio. The chances continued to swing back and forth. A flurry of activity at the Northeastern net in the 31st minute saw shots by Segan, sophomore midfielder Erin Dailey and redshirt sophomore defender Lauren Kelly blocked away from the goalmouth. But just two minutes later, it was the Huskies that were throwing their arms into the air in celebration. Huskies forward Olivia Ware, who had come in as a substitution less than a minute before the tally, buried a cross in the back of the net to put the visitors up, 1-0. The next few minutes were tense ones for the Tribe, as a series of near misses — a ball skidding just across the College goalmouth, a diving save by Briguglio, a shot sailing just over the crossbar — kept the deficit at one for the Tribe. In the second half, however, the team wrested back some momentum. Segan found more scoring opportunities, forcing a save on a header shot and placing crosses through the Northeastern penalty box that never connected for a pass. The Tribe spent the last five minutes feverishly trying to set up in the offensive zone for opportunities that never quite coalesced into that tying goal. As the final horn sounded, the College was forced to concede the 1-0 loss to end its regular season. The loss puts the future of the team’s 2018 season in flux; it now has to wait until Tuesday to find out if it will be competing in the postseason. If North Carolina-Wilmington defeats Elon in the final regular-season match of 2018, then it will be the Seahawks heading into the playoffs instead of the Tribe. The match marked the conclusion of Shackford’s first regular season as head coach. With her return to her alma mater, where she once led the team to four consecutive National Collegiate Athletic Association tournaments as a player, she worked to bring a culture of positive reinforcement to the team. The relatively young roster will have a strong existing core to build on heading into next season. Two players who have been key to this season’s successes, leading scorer Segan and starting keeper Briguglio, will both return for their senior seasons next year. Defensive core members Kelly and junior defender Hannah Keith will also be back with the team. After the 2017 squad lost half of its scoring power with the graduation of a sizable senior class, the ability to build on this year’s success is a unique chance the team never got last time around. But for this 2018 squad, it’s not time to say goodbye just yet. The team will be watching that crucial conference matchup Tuesday. And if the Phoenix win, the College will be traveling to postseason action Friday.